"Rosstroytech" is an engineering company specialized in design, development and manufacturing of welding machines and processing wire equipment for construction industry. Worldwide shipping. "Rosstroytech" is a group of industrial companies manufacturing weld machines, equipment for reinforced concrete plants and metal processing systems. "Rosstroytech" is a leading Russian manufacturer of serial and custom automatic welding machines, equipment for production and resale of wire & rebar processing products, as well as concrete product plants. Supply geography covers all of Russia, CIS countries, Baltic countries and Far East region. "Rosstroytech" machines & equipment are universally fit into the business and production infrastructure of any enterprise manufacturing products from wire and reinforcement steel, as well as enterprises of the construction industry through a combination of ergonomics, functionality and design. The annual production output is over 300 pieces of machinery and equipment. Qualified staff totals more than 120 people. Download presentation (PDF, 2 Mb). "Rosstroytech" is specialized in the following areas: a high-tech welding equipment (multi spot resistance welding, 3D fence production, masonry mesh, reinforcement flat cages & frames, etc. ), complex upgrade of concrete product plants (design and renovation, modernization and scaling), production of reinforcement processing machines and concrete forming equipment, as well as ready-made business solutions "turnkey" (piles production, hollow core slabs production line, etc.). "Rosstroytech" has one the largest industrial base and capacities for design and construction of modern factories, production of building materials technology. Total production areas exceed 3,000 square meters. Application of the latest innovations and technologies, branded components, advanced methods of automated assembly and highly qualified department of industrial design provide high quality machinery products. The combination of effective project management, quality assurance, assembly equipment and strong manufacturing base provide a clear willingness of products in a timely manner. Main advantages of "Rosstroytech" are: full production cycle, high operational reliability, fast and intuitive setup of equipment, efficient aftersale service & support. "Rosstroytech" extends the sphere of influence in specialization and chooses new trends in construction, welding machinery, building materials and consumer goods. Our results are in successful integrated supplies of machines & equipment for Russia and CIS countries. We are growing up every year, benefiting the state and society, namely: creating new jobs, producing advanced equipment and improving the welfare of people. 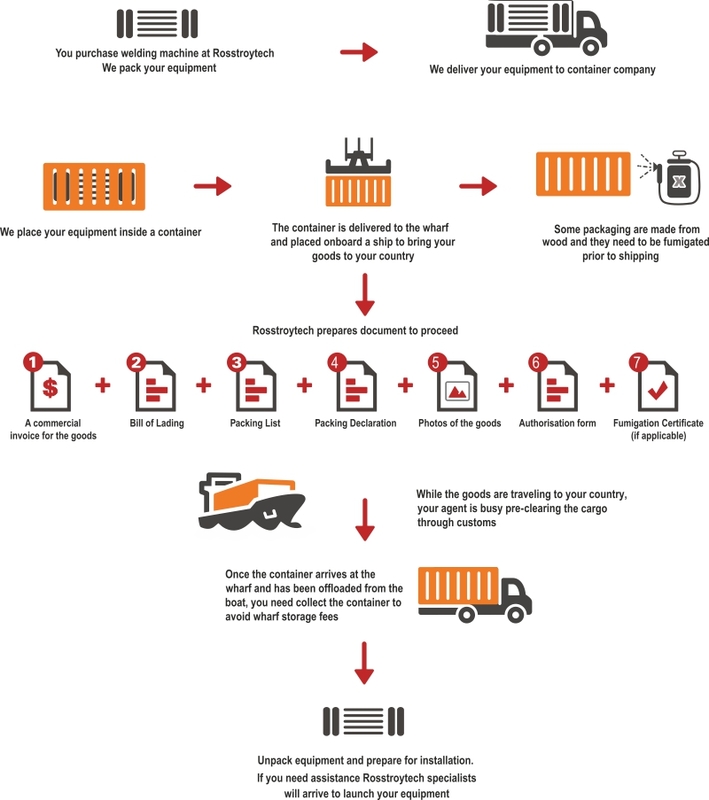 Sea freight FCL how does it all work?